Indibox’s old-world, mortar and brick store at the heart of Jayanagar showcases modern designs crafted from traditional textiles. They offer great discounts too! When Aarti Deshpande moved to Bangalore, she brought along her passion for fashion and the brand that she nurtured – Indibox. Starting off as an online brand in Delhi (they still have their virtual store and you can also shop for their collections on Jaypore and other sites), Indibox has in the recent past embraced a more sustainable and fair trade route. And their little store, near Madhavan Park in Jayanagar, looks to reflect this ideology. The two-room store has been open for the past six months. When you step in, head straight to the larger room where they have on display their latest collections. Indibox makes your trip to Jayanagar worth it by extending great offers on their products. The floral, sleeveless jackets, made from cottons, are retailing for just INR 850. You can also pick up indigo kurtas and flowy, pristine white kurtas with bright Mughal prints for a discounts. In case they don’t have your size, the store does stock running fabric from which they can tailor make the design of your choice. You can also get hand-block Bagru prints and Chettinad sarees for anywhere between INR 1,000 – 2,000. Outside, you can browse through a rack stacked with designs from all across the board. They have Ikat tops with cute little pockets that’ll go great with a pair of jeans. They also have dresses and skirts made from the same fabric. 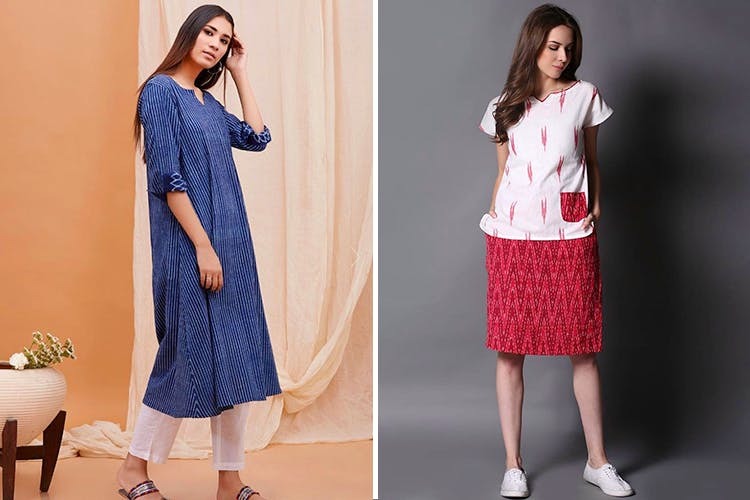 You can also pick up tunics and flared tops made in deep-hued Kalamkaris that are perfect to wear to work or when you want to dress easy breezy. Palazzos and printed, cotton pants are part of their collection too Indibox is looking to expand their collection soon to include sustainable home linen. They are also looking to host a yard sale in early July so you can look forward to some great deals then.